I got to play a couple tunes and rap about First Night 2016 on the Bill Newman Show on 1400 WHMP just the other day. Monte Belmonte and Natalia Muñoz were filling in for Bill. You can check it out below (or click here). My interview starts at the 17:25 mark. But if you want to jump right to the music I perform “Come Back July” at 23:30 and our new song, “Love Is All Around You” begins at about 36:00. 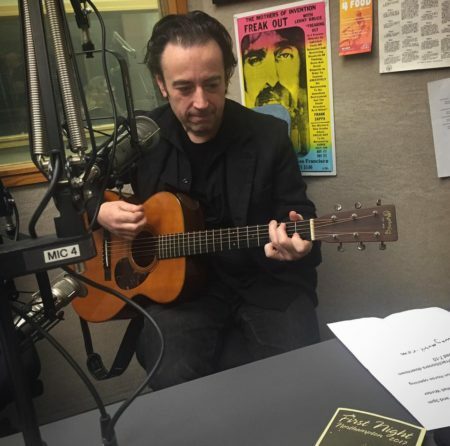 Thanks to Monte, Natalia and all at WHMP/WRSI for always supporting local music, art, and everything else. A reminder: Colorway plays at The Parlor Room on Masonic St on First Night at 2pm and 3pm. All the info is over here on our Facebook Event page. Hope everyone who could potentially be cold right now is staying warm. Lord knows it ain’t easy sometimes. It was inspired in part by John Denver and Rowlf The Dog’s version of the same song in the classic holiday album, John Denver and The Muppets: A Christmas Together. I got to perform it on my decades old Fender Stratocaster in front of a sold out crowd when I opened for the amazing Quinn Sullivan and his band at the Narrows Center For The Arts in my hometown of Fall River. It was such a great show and I’m ever so thankful to Patrick Norton at the NCFTA for believing in me and my music and continuing to put me in front of throngs of ravenous music fans. If you are one of the many people who signed up on our mailing list at that show, welcome! Thanks for supporting independent music. 2017 is shaping up to be one of our busiest years yet with some special shows for this winter yet to be announced. But first we need to close out 2016 with style. It’s be a momentous twelve months. Getting to open for Foreigner, Richard Lloyd, Ian Hunter, and being included in the Green River Festival were just a few of the highlights of our almost 50 shows this past year. We’ve made so many new fans and friends over this past year it’s hard to keep track. So thank you, again, for appreciating what we do and making the effort to get off the couch and get out to see us. We can’t do this without you all. And if you know someone who need the power of some rock and roll, as always, share us with them. Send this email along or just send them a like to our website, our Facebook or Twitter. It’s all at the end of this email. We’re working on some new material that will be on our next album and gearing up for a tour of the Southeast this April/May. Stay tuned for more info on those shows. But like I said, one more night of music. Or I should say afternoon. That’s right, our final two sets of 2016 will be on New Year’s Eve at 2pm and 3pm at one of the best rooms for live music in the whole valley: The Parlor Room. And no need to go trudging across town for us as the Parlor Room is smack dab in the center of downtown Northampton. Each 45 minute set will be a little different for each crowd. But make sure to get in line early if you want to make sure to have a most relaxing seating experience as the Parlor Room is an intimate venue for sure. All the info on the show is below. But if you want to skip right to the Facebook event page it’s right here! I’ll send another email out after that show about all the rest of January’s shows (like the one on Saturday, Jan 7 at the Warwick, MA Town Hall with “Super Supper”) but let’s just leave it be for now. I know everybody is busy this time of year and I thank you if you’ve read this far. There you go, folks, on behalf of Riley, Matt and myself we wish you a very peaceful, joyous and serene holiday and a very happy new year filled with music, laughter, love and the magic of endless discoveries. Yep, that’s a lot to hope for. But a boy can dream, can’t he? Thanks again for staying connected. For a full list of all our upcoming shows check out our shows page right here. We’ll see you when we see you. Oh, and rock on, all. This will be our third First Night Northampton and we couldn’t be happier to be playing early and in one of the best rooms in the whole town: The Parlor Room! Cost: admission included with purchase of First Night Button. Details on prices and where to buy here. Click here for a list of performers and times. Updated periodically.